On March 28, the Valdai Discussion Club together with the Russian Venture Company held a discussion under the auspices of Club 2035, focused on education and the development of education in the future. The discussion began with a presentation by Mikhail Sokolov, Professor at the Department of Political Science and Sociology of the European University at St. Petersburg, on the ideologies that drive higher education and its history in Russia. Sokolov divided the development of education into four main ideologies: technocratic, which seeks to use universities as tools for the military and economic development; social engineering, which seeks to equalize outcomes for social groups on the basis of merit and not wealth; presentational, which seeks to showcase the country’s scientific achievements; and humanistic, which seeks to deliver on the right to education. At the same time, students’ motivations range from the professional goal of finding a career, to the reproduction of their parents’ social standing and the situational goal of delaying adulthood. Sokolov noted that only the professional motivation matches up with ideologies of the university, while the others are either not impacted or cause conflicts with the student body. Outlining the history of the university in Russia, Sokolov noted that most came out of the state rather than being built into it, initially with the goal of generating national prestige. Toward the end of the imperial period, specialized polytechnic universities began to be created with the goal of assisting the military and technological development. Following the 1917 revolution, the new Soviet government was able to abolish the goals of international prestige and humanism, instead focusing on technocratic and social engineering goals, although this was rolled back over time. Starting in around 2006, when universities again had money for development, technocratic tones grew, together with the creation of the Unified State Exam, which is a social engineering project, and the presentational ideology of forcing universities to compete in international ratings. Looking at the future, Sokolov outlined issues, such as a growing lag between what universities offer and demands of the labor market, the low quality of instruction in fields such as economics and business and issues with online instruction, which while growing human capital reduces social capital. He also noted that the education system does not have to be adapted to modern realities, and can instead be a challenge for students to overcome as a preparation for adult life and building social ties. 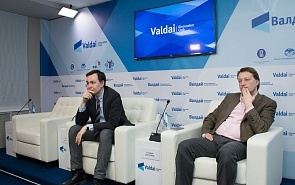 Timofei Bordachev, Programme Director of the Valdai Club, noted that the Unified State Exam has served to take the best students out of Russian regions while the Bologna Process has taken the best students out of Russia, as is the case in the Faculty of World Economy and International Affairs at the Higher School of Economics, where he teaches. “One of the problems we face is that the 10 percent of the best baccalaureate graduates never return to Russia, and we never see them again in Russia’s economy, political science or anywhere else,” Bordachev said. Yuri Simachev, Deputy Head of the Russian Science Foundation, noted the role of parents in education and said that it is impossible to forecast what fields will be in most demand in the future, as acting on this will change the forecast itself. He also noted the importance of lifelong learning as a key to both professional success and economic development. Regarding internationalization of education, Sokolov said that there do not have to be many centers of nuclear physics in the world, and that not preparing students who leave the country may itself doom Russia to poor quality education. Participants also discussed the 5-100 Project of the Ministry of Education and Science, which seeks to put five Russian universities in the top 100 global rankings. The discussion also touched upon the values and way of life of Russian youth, based on a recent Sberbank study. The meeting concluded with a discussion of advances in the robotization of medicine and the importance of developing both open-ended and closed system thinking among students, as well as the complexities of regulating education funding. Sokolov closed the discussion by saying that the main factor of a university’s strength is the quality of its students, and therefore its reputation.